Don't be a martyr. Protect and look after your hands and improve your long term performance and development. I also shake a lot of hands. One day, after a handshake, the client asked if I’d been doing a lot of yard work. He seemed a bit embarrassed and I realized how rough my hands had become. I was healing from a recent rip and the edges of the tear were hard and scratchy. As soon as I fell in love with the feel of a barbell, I developed calluses and tears. I’ve ripped and healed and ripped again. I felt pride and awe the first time my hands bled from too many toes to bar. But after that I realized the injuries to my hands kept me away from the pull up bar and made the barbell painful to hold. I’ve tried gymnastics grips, gloves, athletic tape, grippers. But nothing felt as good or worked as well as feeling the cool, chalky bar with my bare hands. I soon learned that the best treatment for a rip is to prevent it. It starts with the grip. Although adjusting your grip on the bar won’t completely prevent callouses, it will reduce them. If you currently grip the bar with your palm, try gripping the bar at the base of your fingers. This way less skin is compressed between the bar and your fingers, and you’re able to move with the bar more easily. The combination of bars and chalk and friction make the development of callouses unavoidable. The more we work, the bigger and harder our callouses become. Chalk dries out our hands and causes roughness. Rough, hard skin gets caught on the bar and rips. 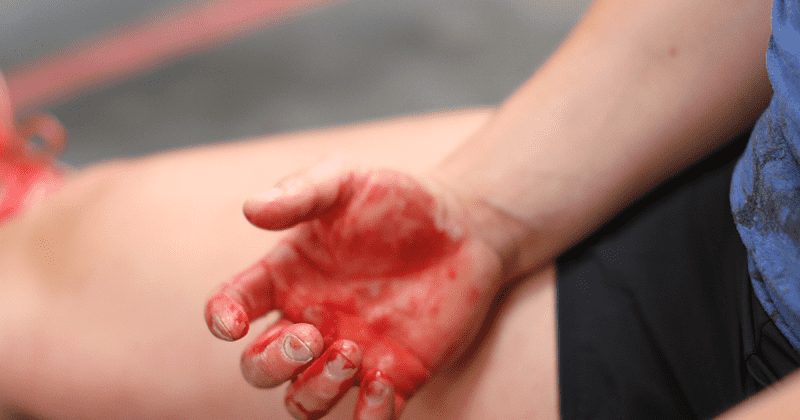 How do we prevent our callouses from turning on us mid-WOD? 1. File them down or shave them. “Use a pumice stone or a razor if you need to,” says Robin. A good time to file your hands is after a shower when your callouses are a bit swollen and soft. File until you no longer feel hard edges. Your skin will still be thick, but it needs to be smooth and consistent. And yet, when we do rip (although we swear we’ve followed all this great advice)…? 3. Ripped hands: clean first. Wash your rip with soap and water. (And wash the barbell – or rig – too. No one wants to share your hand slime or blood!) Cut away the skin as close as possible to the rip. Leftover skin gets hard and will catch on the bar to cause another rip. “Pack in a salve,” adds Robin. “Really pack it in. Then wrap your hand with some gauze. You want to protect the tear but you also want some air to get in.” You can use a topical antibiotic like Neosporin. The idea is to keep it clean, treated and covered. 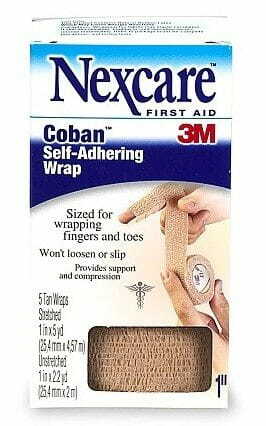 One of my favourite products for bandaging my hands is self-adhering wrap. I wrap some normal gauze around my hand, then secure it with the wrap. 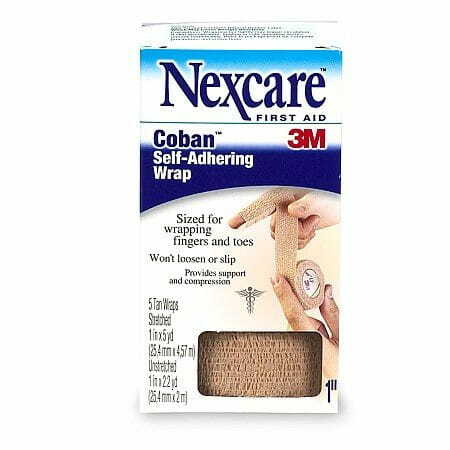 It doesn’t slip off like a band aid, and it doesn’t get all grimy and stiff like normal medical tape. Robin recommends sleeping with a sock over your hand. It’s a good way to let the wound breathe and it prevents the salve or topical antibiotic from getting on your sheets. But what if we can’t stay away? What if we can’t resist? How do we protect our hands while they’re healing and still get some time in at the box? 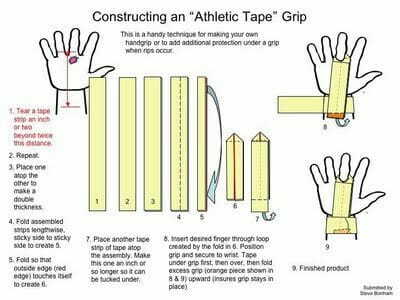 You can make some grips from athletic tape. Here’s a chart on how to do it, but you can also Google “how to wrap hands” for different methods. Making your own grips to use them for WODs with a lot of bar work can also help prevent rips. Remember 14.4? All those toes to bar? I knew I was in trouble when I started to see flakes of skin falling from the bar. By the time I was finished, my hands were torn and bleeding. I had some topical antibiotic in my gym bag. I immediately washed and dried my hands (hellfire!) and packed in the antibiotic. For the next few days I applied treatment regularly and within a week my hands were good enough to go back to WODing. Ever since 14.4, I’ve kept a hand care kit in my gym bag containing antibiotic, bandages, athletic tape and gauze. Not only has it come in handy for me, I’ve also shared with fellow CrossFitters. Don’t wait until you rip to start taking care of your hands. They’re an important part of your training and progress.